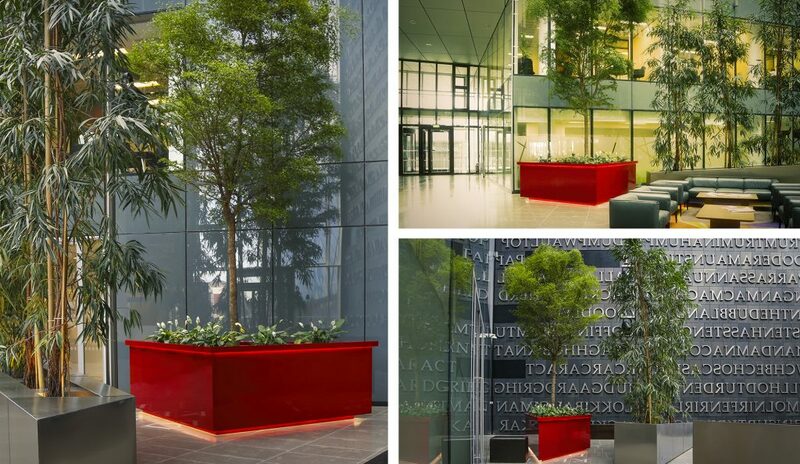 Europlanters were specified by Greenscene Interiors to manufacture some bespoke, giant, illuminating planters for an office block in Grand Canal Square in Dublin Ireland. 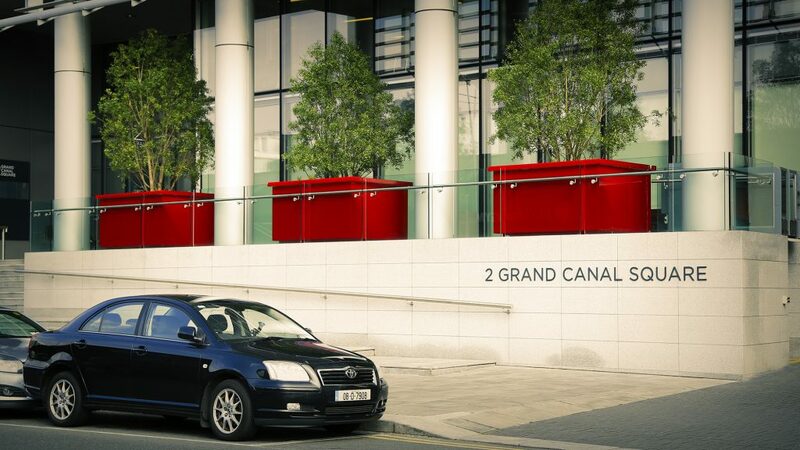 The location for the planters is a prestigious office block is within 10,000m² of a new commercial and cultural development overlooking Grand Canal Square and Harbour. As the trough planters were being placed outdoors Greenscene Interiors used A frames to install the trees and as 3.5 metre tall Maytenus Boaria were being placed in a in a windy location stainless steel guy ropes were attached to the stainless steel fixing points that were installed in the planters to support them. 6.5 metre tall Bucida Buceras trees were planted in the interior triangles with Spathiphyllum used as under planting. In total 17 Tonnes of compost and 4.5 Tonnes of drainage media was used to plant the trees and the planting for both interior and exterior were supported by Mona tank irrigation systems. This exciting urban space in Dublin’s South Docklands and the hub of Dublin’s transport network has undergone substantial redevelopment to include office blocks, retail outlets, hotels, bars, restaurants, a theatre and high end residential developments. The building has 7 floors over ground with basement parking. 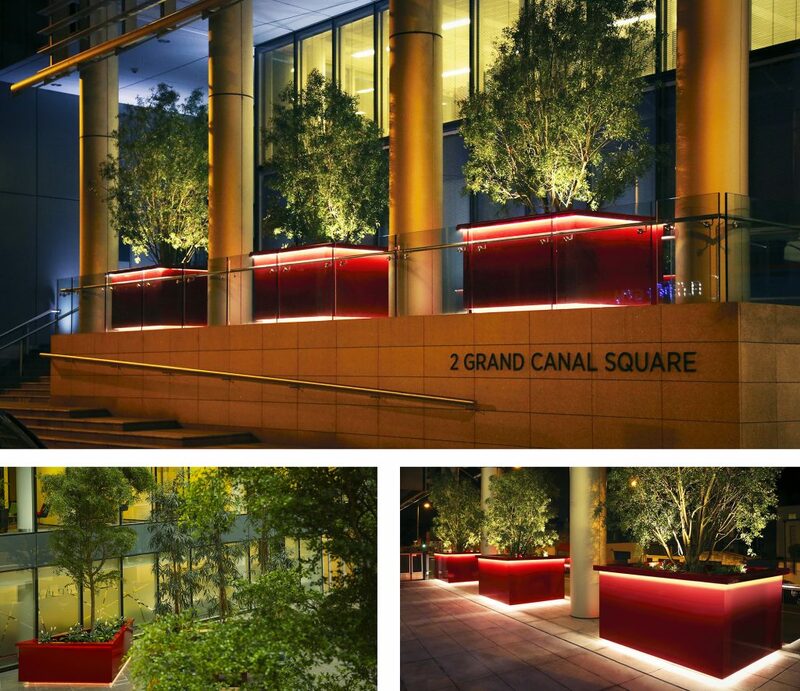 A scheme was created by a design team using giant planters finished in a satin RAL 3003, chosen to compliment the ‘red carpet’ a resin glass paving and the red lipstick lights of the grand walkway. The planters were for outside the entrance and within the large atrium of the building. The LED lit triangle planter sides measured almost 4m in length and 1.1m high and echoed the geometry of the space, along with the stained glass panels in the skylight roof which were an integral part of the building. 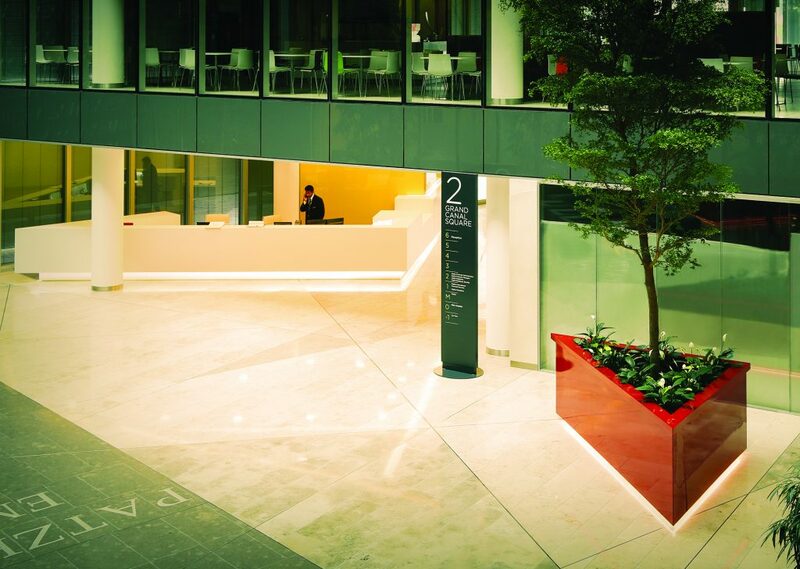 Whilst the illuminating trough planters 2m/1.5m/1.1m High in size reflected the vibrancy of the region. The design team flew over from Dublin to the Europlanters factory in Cheshire to consult with the production team and inspect the first giant planter. As the planters were so big they were reinforced and braced and stainless steel was used to support the LED lighting and the guy fixing points. The project took eight weeks to complete from mould to finished product. Once completed the planters weighing approximately 126Kg each were lifted by fork lift trucks onto 44ft waggons and transported in two batches 197 miles across the Irish sea to their new prestigious location in Central Square Dublin.